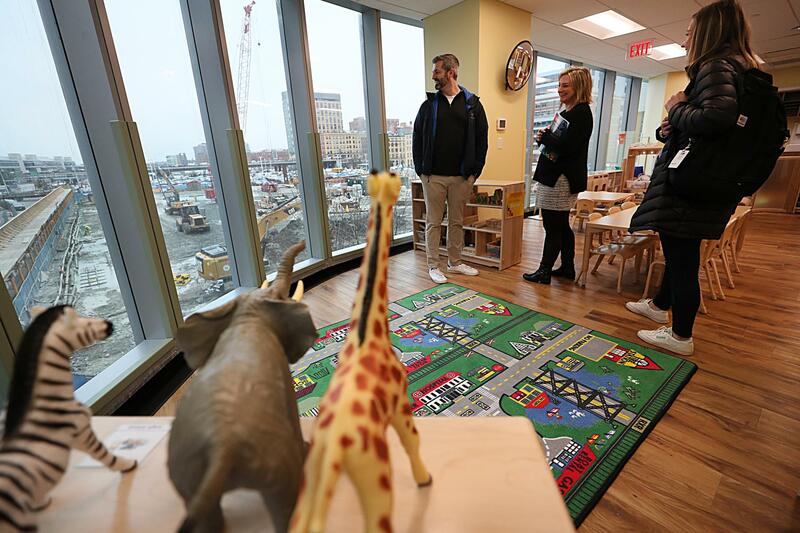 A KinderCare is opening soon as the Seaport District takes shape outside its windows. For the last decade, Christine Savage has had an arrangement with her neighbors on Congress Street. When she hits a hitch in a recipe, the 59-year-old wanders downstairs and asks the chefs at Sportello, the Barbara Lynch trattoria, for lemons, flour, or a bit of feta cheese. Her chef-neighbors sympathize with her plight: If you live in Fort Point or the Seaport, you can buy a gourmet fried chicken sandwich from one of a dozen fast-casual restaurants — but just try finding a place to buy actual groceries. This rapidly developing section of the city comes up short in other community-engendering retail aspects, too. Need boots? Yoga pants? Upscale options abound. But there’s nowhere to buy a good book. So in evolutionary terms, the Seaport entered a new epoch with the recent announcements that both a supermarket and bookseller will open in the coming year. Other essentials are in the works, too: A huge new day care opens this month, and a waterfront playground will come alive when Martin’s Park opens later this year. In other words, the district just might be on its way to becoming a neighborhood. 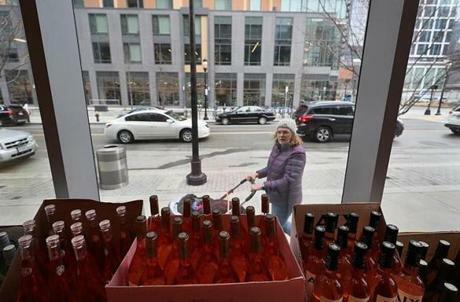 This month, Trader Joe’s confirmed the simmering speculation that it is hoping to take up residence in the building at 44 Thomson in Fort Point, joining a collection of trendy outposts in a complex that includes the bartaco restaurant and Trillium taproom. The Seaport District has added several stores and amenities that bring a more neighborhood feel to the area, including Cardullo’s Gourmet Shoppe on Seaport Boulevard and Frank Anthony’s Gourmet Market on Fan Pier. A company spokeswoman, Kenya Friend-Daniel, said in an e-mail that she would have more specifics in the next month, but if things go according to plan, it will be the California-based grocer’s 20th location in Massachusetts. The prospect of an actual grocery store within striking distance delights Savage. Her neighbors were similarly delighted when Eve Bridburg, executive director of the GrubStreet writing program, announced this month that Porter Square Books will open a second location in the literary nonprofit’s new narrative arts center at 50 Liberty. The bookstore will occupy 1,700 square feet of a 5,000-square-foot street-level storefront at Fan Pier that will include a cafe and performance space. The narrative arts center, with an additional 8,000-square-foot writing laboratory on the building’s second floor, will open in the late winter or early spring of next year. Sean Selby, a principal at the Arrowstreet architecture firm, said that while he’s not ready to call the new additions a tipping point yet, adding such human-scale elements to the Seaport is a promising step. “It takes a lot to transform an area from parking lots to neighborhood,” he said. In addition to its new bookstore and grocery store, Selby said, he also hopes the neighborhood gets ceramics studios and other such “maker-spaces,” as well as places for families to swim and small locally owned restaurants and pubs. “These types of ‘third rooms’ are for people who live there, and it’s what the Seaport really needs to help fill it in with life,” he said. 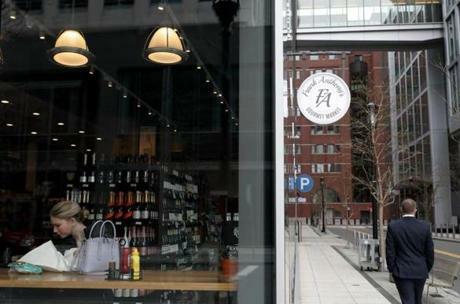 Frank Anthony's Gourmet Market on Fan Pier in the Seaport District, where there may be an attempt to add places to create more of a neighborhood or community feel. Yanni Tsipis, who is overseeing the build-out of the Seaport’s retail corridor for WS Development, said the developer’s plans do include additional venues that will add to the civic fabric: a 600-seat Seaport Performing Arts Center, a 150-seat Fort Point Community Theater, a new 1.5-acre neighborhood park, and two additional civic spaces in future buildings. And he said the developer remains committed to securing a full-scale supermarket as a tenant. But he pointed to a few other recent developments that may make the glass-and-chrome district feel a little homier. The new KinderCare day care, which opens this month, will be among the neighborhood’s largest child-care facilities, with 102 slots. Young families that have been moving to the neighborhood have been eagerly signing up, said Joanna Siegel, the center’s director, who greeted parents at an open house last week. A mobile post office now serves the neighborhood four days a week, Tsipis said, and the Seaport Farmer’s Market, a partnership with the Boston Public Market, started last summer in Seaport Common. GrubStreet’s move came as a result of the city’s announcement in December that the nonprofit was selected as the beneficiary of the Boston Planning & Development Authority’s effort to establish “civic-cultural spaces” in the Seaport. The addition of the bookstore and event space will add to the “social infrastructure” of the neighborhood, said Bridburg, and serve as a convening hub for the nonprofit’s writers and students, who will be relocating from the 3,500-square-foot office it has occupied in Downtown Crossing for most of the last two decades. “For many of our writers, GrubStreet feels like their writing home, but there are only two little red couches for people to hang out on,” she said of their current digs. David Sandberg, co-owner of Porter Square Books in North Cambridge, said the store will be an important addition to the area’s literary scene. “Boston prides itself as this city of culture, but it’s totally starving for bookstores,” he said. Both he and Bridburg acknowledged the challenges that may arise upon entering a neighborhood whose cultural bona fides are still unproven. Bridburg said she is hoping to assuage concerns among students about accessibility, both in the physical sense, by securing affordable parking options for visitors — which are scarce in the Seaport — and by offering scholarships and other free programming to the community. She said she’s already been in talks with the Boston Public Library about cohosting events at the site (the Seaport currently has no library). Sandberg said he is cognizant that the Seaport lacks the diversity he’s accustomed to in Cambridge. A Globe Spotlight investigation found that only 3 percent of the district’s population is black, and the median household income is nearly $133,000 — the highest of any ZIP code in Boston. “We’re not going to change the demographics of the neighborhood,” he said. “But I suspect and hope that the residents are going to care about localism. They’re moving into the space and they want a neighborhood.